Anything you like on your Bacon Cheeseburger! Lightly grease a 9 x 13 inch dish. Use the deepest one you have. Spread ½ of the thawed french fries in the bottom of the dish. They will not completely cover the bottom. In a large skillet, brown the ground beef, onion, garlic, salt and pepper over medium high heat. Remove beef with a slotted spoon and set aside. Drain the grease from the skillet. Return the skillet to the stove top and melt the butter over medium heat. Whisk in the flour and cook for about 2 minutes until bubbly. Slowly add the chicken broth and milk, bring to a simmer and remove from the head. Whisk in the softened cream cheese, sour cream and ranch dressing mix. Place ½ of the beef mixture over the french fries in the prepared dish. Cover with ½ of the cream cheese mixture, followed by ½ of the Colby Jack cheese. Repeat layers with the french fries, beef, cream cheese mixture and Colby Jack cheese. Bake covered at 375 degrees for 45 minutes. Uncover and sprinkle with cooked and crumbled bacon. Return to the over and continue baking uncovered for 15-20 more minutes. 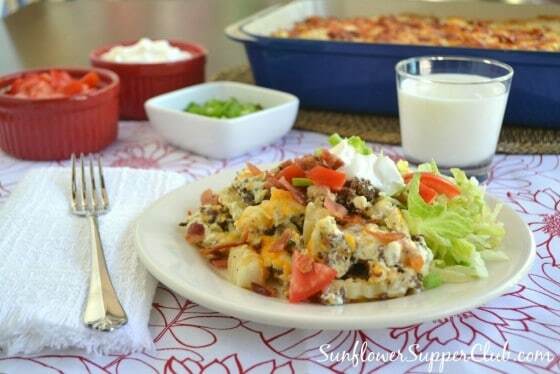 Serve casserole with desired toppings. WOWZERS! I use to make something similar (& simpler) when my kids were young too. I love the addition of cream cheese to anything! How awesome you found something your picky eater will enjoy too. YUUUMMM-OO! I’d say this is a real winner. Thanks Marsha! Also, thanks for pinning! Thanks! Let us know if you try it. It is also great with tater tots. Thanks so much for stopping by! Hi… I’m visiting from Weekend Potluck. I love casseroles. They are easy to throw together and there are usually leftovers for the next day. Your recipe looks fabulous. I am making this tomorrow!! Looks yummy!! Thanks Kathy! I’m heading over to check it out. Thanks so much for stopping by!